During the cold winter months, sometimes the temperatures are so frigid and wet, that the opportunity to spend time outdoors sounds the least bit appealing. Of course that doesn't stop my little one from eagerly asking to go outside and play. I can totally understand his disappointment when it may not be a viable option. The main character in our latest picture book, Rain, also knows what it's like to eagerly await all the fun he can have by going outside to play, and the disappointment that can happen when the weather isn't necessarily cooperative. The storyline in this book is simple, but a special one at that. 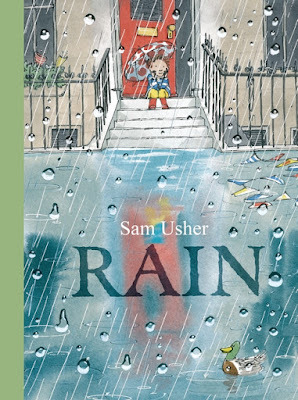 The little boy in the story wants to go outside and play in the rain, but his grandfather would rather wait it out until the downpour passes. The boy does his best to be patient, but soon he peruses through a few books around the house and finds play ideas that only make his anticipation grow stronger and stronger. He imagines all of the things that he could do like go on a voyage with sea creature or visit a floating city, if only he could go outside to play in the rain. Finally his grandfather gives in and they go outside, only to enjoy an adventure even more magical than he could have ever imagined! Sometimes the best things come to those who wait. 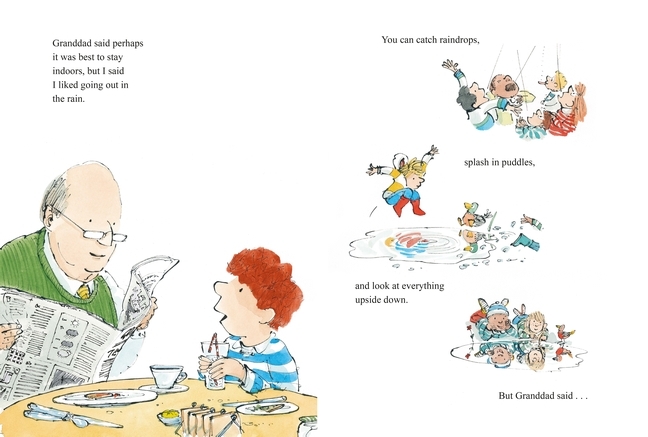 I'm such an advocate for early childhood reading, so I really appreciated the little details in this story like having the little boy keep himself entertained by reading various books. Actually, I personally feel that this was an intricate part of the story, since all of that reading sparked his imagination even more. This in turn made playtime even more adventurous for him when he finally went outside. Besides being an adorable children's story, some of my other favorite aspects of this book are the cover design and illustrations throughout. 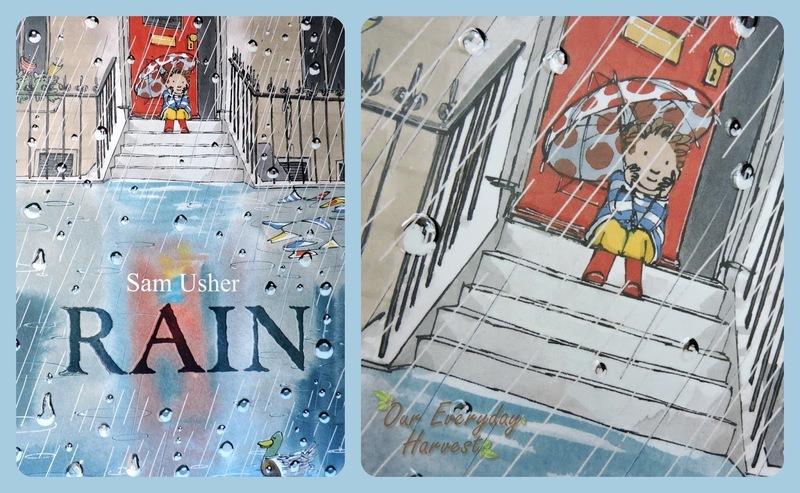 The front cover really encompasses the whole ambiance of the title, with each rain drop covered in a glossy coating to make it look as though the book is actually wet. The illustrations inside are full of vibrant color and there are all kinds of details on each page that really bring the entire story to life. Rain is the second book in a series of four written by Sam Usher, all based on the weather. 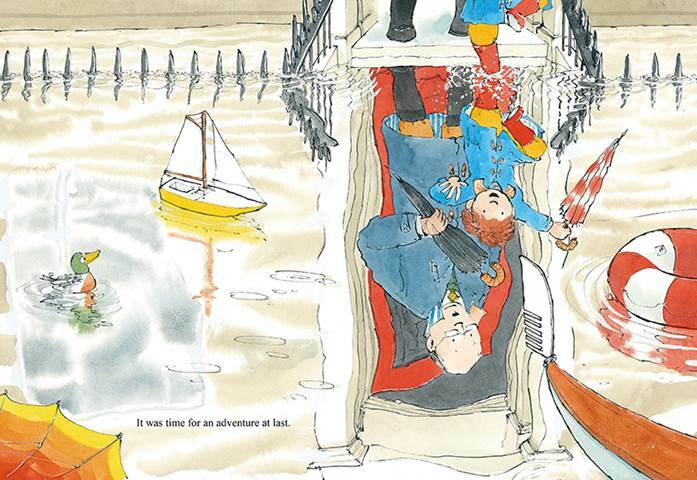 Snow is the first one in the collection, and although we have yet to read it, I plan on adding it to our wishlist, since we particularly enjoyed this delightful story.